Whenever I think about Dundee cake it reminds me the Christmas offering by Flury’s a cult eatery in Kolkata. In my Central Kolkata residence, Baba used to bring it along with the rich fruit cakes from Nahaums. Not that, I was aware of the difference between a traditional Dundee cake and Fruit Cake then but I used to like the Dundee cake for the simple decoration with blanched almonds always over a typical fruitcake. Yes, it was solely for the decoration; a light fruit cake with flower decorations with almonds over the top! I came to know about the difference after many years when I started baking. 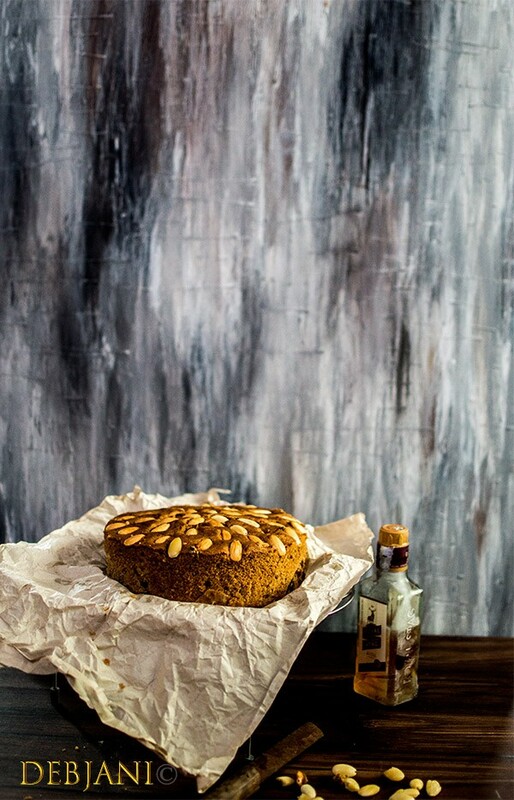 In fact, when I was in Gurgaon a friend requested me to bake her an authentic Dundee cake. Since then I bake it every year. I have tried several recipes and obviously searched a bit for the famous Dundee cake and yes some interesting history exists! As the story goes, this particular variety is invented by the Scotish bakers and probably prepared first keeping in mind the preferences of Mary, Queen of Scots who reigned in Scotland back in 16th Century. It is said that she didn’t like Glazed Cherries and hence a light fruitcake was prepared for her devoid of the cherries and specifically with blanched Almonds and named Dundee Cake. This cake, however, named after the Keilers of Dundee when it was made commercially first in the 19th century. At this time, however, they started incorporating Glazed Cherries while baking the cake. 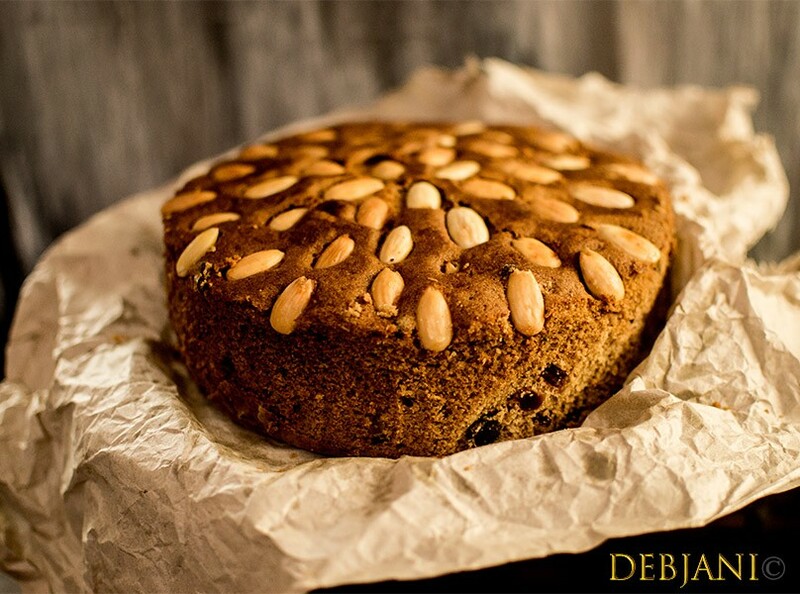 Traditional Dundee Cake is actually a form of light fruit cake, decorated with Blanched Almonds on the top and is a very good alternative to typical rich fruit cake. 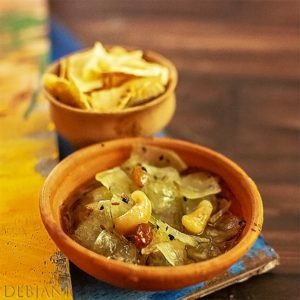 Another important thing about the recipe is there is no need to soak dry fruits in alcohol to make this version of fruitcake. This means this is actually a type of last-minute Christmas cake! 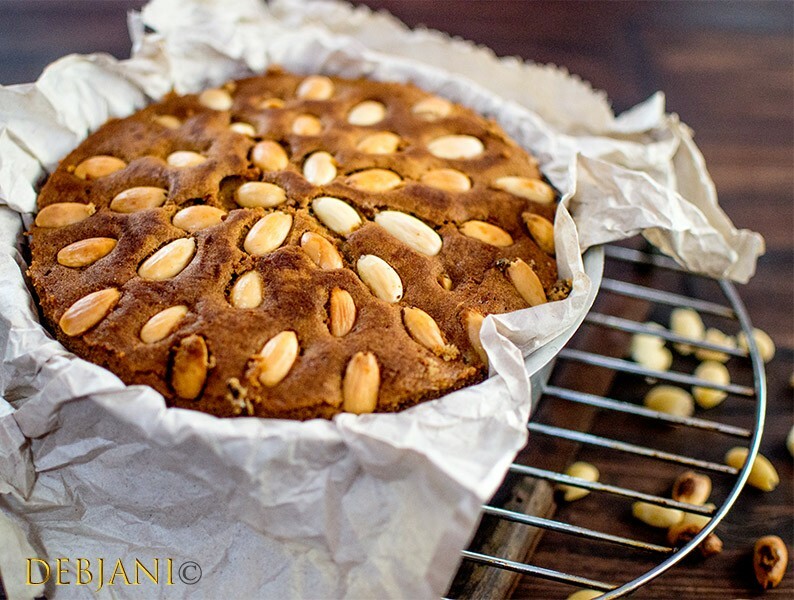 Finally coming to the traditional Dundee Cake recipe, it calls for Almonds, Sultana, and a few dry fruits. I, however, followed a recipe from The Evening Independent (1936) and it came out amazing! They took the recipe from the Boston School Cook Book. Now with little alteration, I follow that recipe to make my Cake. Traditional Scottish Dundee Cake! Recipe and beyond! Take Almonds in a bowl and pour boiling water over the almonds and cover the bowl for 5 minutes. After 5 minutes take the almonds out and rub using your hands to peel the skin. Line a Round cake tin with Parchment paper. Sift Baking Powder and Flour together twice. Take Butter at room temperature in a bowl and start beating it to cream. Add Brown Sugar and beat till the sugar dissolves completely. Now add Eggs one by one and mix using the beater. Start incorporating the Flour into three batches and mix lightly following cut and fold method. Now add Candid Peel (Orange and Lemon), Raisin, Currents, Sultana, Glazed Cherries, Whiskey, Orange Juice and mix. Bake the Cake for 45 minutes on 150 decree C and take it out of the oven. 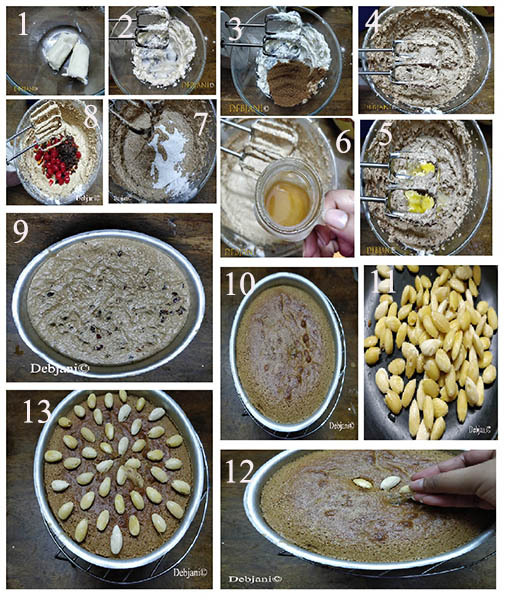 Decorate the top of the cake with Blanched Almonds in a way to create a floral design. Again bake the cake at 150 degrees C or on the lowest temperature of your oven for 1 hour or till the cake browned from the top and cooked from inside. Boil the Milk along with the Castor Sugar.and brush the cake with the mixture. Bake the cake again for 2-3 minutes at 180 Degree C and take it out of the oven. Cool the Dundee cake on the wire rack and cover it with Parchment paper and wait for 2-3 days before serving it. If you want to make Alcohol free version of the Dundee cake, just replace Whiskey with an equal amount of Orange Juice. If not available replace Sultana with the equal quantity of Current. Baking time varies with Oven to Oven, keep that in consideration while baking the cake. This cake requires slow baking. By the way, I hope the question I asked, whether Dundee Cake is a substitute for the Rich Fruit Cake is answered! 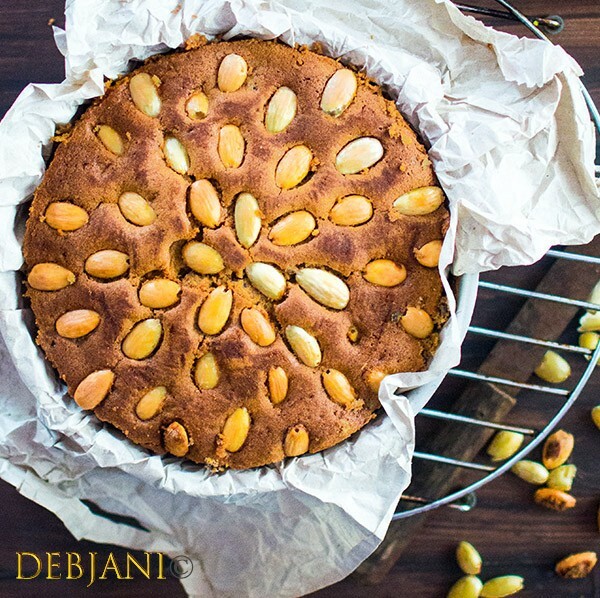 Have you tried the Traditional Scottish Dundee Cake Recipe from Debjanir Rannaghar! « Looking Back: Debjani’s 5 star experiences all through 2017!